Luckily for me The Wright Square Antique Mall is practically next door to where I'm interning. So today I popped over & as I was leaving this little gem caught my eye. Adorable paisley & under $15, I couldn't resist. I've been watching a lot of American Pickers.. I can't help myself. So I decided to pick around in the attic while I was home. Fortunately I came across this large goblet that belonged to my mother, unfortunately the top was MIA. I found this Egyptian themed bottle at Goodwill last week. Vase? Decanter? Fabulous! I picked up this little beauty at a thrift store during my week at home. Just one of my treasures, more to come. I'm also jonesing for these pretty bad. 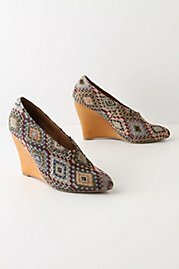 Compliments of Anthropologie. My new favorite shoe, compliments of Aldo. I can't wait to have these babies in my closet. I found this hunting themed wall hanger at Goodwill this afternoon. Perfect for my keys & Bea's leash. The other little vintage gem I picked up at Wright Square yesterday. I'd had my eye on it for a while & it was still there yesterday. It was meant to be. After being the victim of Savannah crime this morning (I suffered a small car break in) I popped over to Wright Square Antique Mall & picked up a couple of things. One of which was this adorable circa 1960s dress & for only $12. I felt better instantly!